and Greg the Rat-Catcher (alternatively Greg the Jack-of-all-Trades): a young, short, childlike little fellow. So unassuming even his class is listed as a blank ____________ on his character sheet. The three of them had already been through a few adventures, losing two of their companions along the way from Baklin, the ducal seat and Erillion’s only major city. The reason for their journey was a generous offer: Lady Callodric, a wealthy noblewoman from the Twelve Kingdoms, was looking for a rare magical flower, and was willing to pay 600 pieces of gold to anyone who’d get it. As recited by Tomurgen the Bard, the flower only bloomed in a tiny valley among the island’s mountains, and it could only be found at night by its faint light. Furthermore, it would have to be harvested by blade, and must not be torn – as an ominous couplet warned, “He who reaps it shall take its blood / But he who pulls shall with his anoint”. Having lost his companions under the ruined mansion of the Perladon family, Gadur Yir the half-orc gathered his valuables before a great fire. Then, as he prayed to Haldor, he cast them one by one into the flames: the magical wolf idol, the red potion from the sea hags, and finally a hundredweight of gold. This was all the sign Gadur Yir would receive, and after a night’s rest, he headed for the forests. The journey through the Forest of Woe had started inauspicious enough. Somehow, navigating even by map proved harder than he had expected, and (lacking the Wilderness Lore skill) he soon realised he was lost. 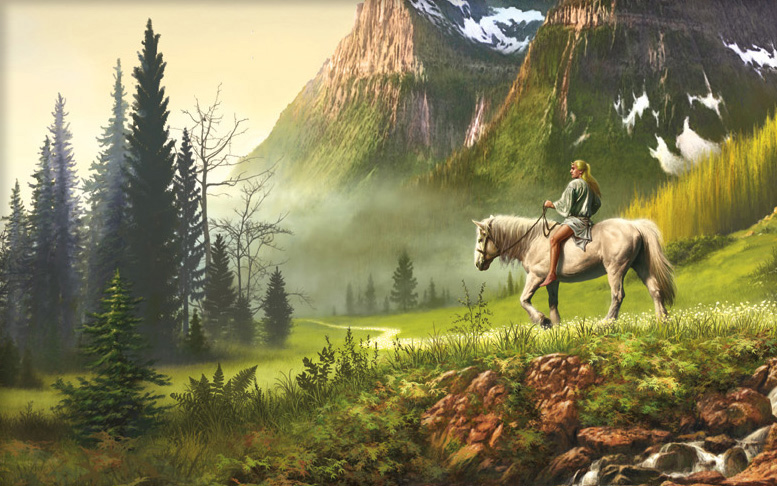 Instead of the low hills he was expecting to head towards, he found himself before a great, rough stone throne that could seat a giant; then, he descended into a shallow valley towards a lake he didn’t find marked on the chart. At night, fires beckoned in a great ruined structure on the lakeside, but the inhabitants of the castle had also noticed him. A pursuit began through wood and bush, and by the time the half-orc had shaken off those following his trail, he had noticed he’d lost his javelins and his trusty lantern. Finally, four days later, navigating at first by instinct and then by sight of the northern mountains, he emerged torn, dirty and tired into a clearing, heading straight for the campfire he had spotted through the trees. “…and I am Franz, but that doesn’t matter matter.” With the introductions and questions about one another’s purpose taken care of – they shared the gist of their quest, and Gadur Yir summed up his misadventures in Gont and later on the high seas – they finally agreed to travel together for a while for mutual protection and the promise of riches. The next day, they left the Forest of Woe and set off towards the mountains that looked more and more massive as they approached. Travelling through the thickets of an abandoned land, they found themselves at the edge of a large depression lined with clay walls. An enormous potter’s wheel stood at the centre, surrounded by broken pottery and misshapen lumps of clay that formed fantastic forms. Was it magical? Franz’s spell said yes. Considering the clay shards he held in his hands, Drolhaf Haffnarskørung spat into his palms, retrieved a lump of clay from the pit’s side, held up the amulet of Gladuor, and went to work on a piece shaped like the top arches of an aqueduct. His work went adequately, but something was missing – something essential and vital. As he looked upon his half-hearted work, there was a tremendous crack and he was struck by a lightning bolt out of the clear sky! Somehow, he stood up, discarding his ruined creation. He was followed by Greg, who thought he could do better, and started working on a sleek dagger, only to bring down another lightning bolt that almost fried him. Stubbornly, Gadur Yir stepped up to the wheel, and praying to Haldor, started to work on a clay shield. He was entirely absorbed by his work, and felt inspired, one with the tools at his disposal. [A 20!] He retrieved a perfectly shaped metal shield from the wheel, and affixed it to his arm (a +1 shield). Emboldened by the half-orc’s success, Greg tried again, shaping a small ring and deftly dodging the incoming lightning bolt that seared his side but didn’t incinerate him. Finally, Drolhaf – turning to Gladuor again – formed a helmet with his hands, and his efforts were rewarded [another 20!] as he created a helm that would protect him against one fatal blow. A few hours’ walk from the wheel, Gadur Yir found an overgrown road, leading towards the mountains. It had not been used in several years, and vegetation, even small saplings had grown up among the stones, and here and there it had been completely buried under earth and sediment. But it lead on, and at last in the afternoon they arrived at their goal. Next to a dammed artificial lake fed by a mountain river emerging from a gap in the mountainside, stood the remains of a makeshift settlement. Its palisade had collapsed and the wooden shacks were in various stages of decay; only a tiny toolshed stood the test of time. Above this former camp, two sets of metal tracks disappeared into timbered entrances. Pit heaps below the tracks identified the place as former mine sites. There wasn’t much to be found in the settlement, although the shed held a collection of pickaxes and miners’ helmets, and was large enough to house four people at night. Although multiple characters were wounded from the lightning bolts, they decided to do some initial reconnaissance at the mine mouths to make sure they would not be ambushed at night. “Who brought the canary?” asked Greg, but nobody answered. Wind was blowing from the left entrance. Franz lit a lantern, and they took a few steps into the cool, wet tunnel. Steady winds were blowing from forward, through the passages under the mountains. They bypassed an abandoned entrance post and a side tunnel which had been mined and abandoned. They reached an intersection where the rails parted into two branches, and they could hear the sound of running water to the northwest. “That must be the stream that emerges into the lake” guessed Greg. “We should press forward a bit” so Gadur Yir. They tried the right entrance, but soon reached an intersection again, with multiple further intersections in close proximity. Greg’s ears picked up the sounds of water to the north and something that sounded like a faint chittering chorus. Deciding not to risk it, they turned back again, and reaching the outside, finally examined the river entrance. Iron bars blocked this low, wide opening, holding back a few pieces of wood. Anyone who wanted to enter this way would wade deeply against the current here – and Greg would be surely overwhelmed. Satisfied nothing would attack their camp from this direction, they returned to camp, although Drolhaf stayed behind to catch a few fat fish in the lake, which they ate along with Greg’s bouillon prepared with the finest herbs. The night was uneasy, and they had once heard horse hooves and human voices from beyond the palisade, but whoever they were, the small company did not linger: they considered this an accursed and dangerous place, and were worried the giants would catch them. Huddled in the shed, the company tried their best not to make a noise, and rested until the morning. Continuing the exploration of the mine, they now chose the entrance to the right, and proceeded to the T-intersection, then crept north along a set of tracks. They could again hear the rushing water and chittering sounds, and emerged into a large, multi-level cavern with colourful stalactites. A small waterfall fed an underground pool, and fat bats were flitting in the air, around what seemed like enormous, furry packages suspended from the ceiling. Across a bridge, a long metal ladder disappeared upwards in the darkness. “Giant bats! Let’s not awaken them… turn back” Drolhaf whispered, and nobody wanted to force a confrontation. “We should return at night, when they are hunting outside. We have more than enough time” he added when they were out of hearing distance. They proceeded to the east, where the tracks divided into several passages. A set of southern caverns, part enlarged natural caverns and part timber-reinforced mines, held a crack in the wall where something black-grey glittered. Silver ore! Using a chisel and a pickaxe, two characters spent an hour at work while the others stood watch; and were richer by 100 gp worth of medium-grade silver ore. One tunnel to the north, the tracks soon ended, but the low-ceilinged passage continued after a tricky bend, slowly sloping downwards. Gadur Yir gestured backwards, and hunched down to investigate this direction. He only took a few steps before something soft and wet landed on him. To his companions’ horror, his head and torso were covered in a vivid green jelly. Greg jumped and quickly took a torch to the slime, burning it off along with some of the half-orc’s hair. Green slime! The deadly mass was everywhere along this tunnel, hidden in treacherous nooks and crevices, and it also seems to have eaten away some of the timbers. “Too risky” Gadur Yir turned, and the rest followed. From another passage came a heavy wind, and stepping forward, they found a badly reinforced ventilation shaft leading upwards and outside. “This is where the bats leave?” Gadur Yir hazarded a guess, but despite the presence of some guano, the shaft was too tight for the larger specimens. Further to the north, a bridge crossed an underground stream, which disappeared through a crack to the west, but cut a more tall, navigable passage to the east. The current was steady but not overwhelming. Greg and Franz decided to stay behind while Drolhaf Haffnarskørung and Gadur Yir went off to investigate. The tunnel was twisty, and the stream was fed by several little rivulets. They heard a harmonic, resonant sound from the east, which grew stronger as they approached. Stepping into a small grotto, the duo beheld glittering walls, colourful crystals embedded into the limestone like the interior of a geode. This was the source of the weird music they had encountered. “It is nice as it rings and tolls, but a real master should polish it to perfection after Civilisation lays claim to it” – the barbarian was already at the natural wonder with his pick. They extracted a backpack’s worth of crystals (some 500 gp value) while Franz and Greg waited impatiently outside. Another side passage opened, this time to the northwest. A smell of wet rot and mildew wafted from it. The adventurers soon found themselves in a round cavern filled with wet earth, and thick colonies of mushrooms, some thick and lumpy, some tube-shaped, some with improbable shapes. Carefully prodding the mushrooms, Gadur Yir stepped in to explore, but was almost instantly ambushed by a horde of long, thick centipedes the size of a man’s arm. One almost bit through his throat [narrowly avoiding an instant kill roll], and cornering the rest of the party, but Franz cast an illusion spell to conjure the vision of a large, fat guinea pig, which divided the monsters’ attention until they were cut up or crushed to a pulp. There wasn’t much else in the room: disturbing a mushroom patch, Gadur Yir was splattered with a greenish goo that was reminiscent of the common stinkhorn’s cap, but the sticky substance proved more harmless than the green slime. The mine tracks continued into another cavern, where they lead to a tall structure constructed of thick beams, heavy chains hanging from a dark hole above. An abandoned mine cart was still standing on the platform of this elevator. “It doesn’t look safe, and the cold wind is coming from the north passage” Drolhaf Haffnarskørung was already on his way. The passage soon turned to the east, but Drolhaf and Gadur Yir stopped to stare at something before them. In a niche in the passage bend, a skeleton was sitting chained to a rough stone throne. The cadaver was wearing a horned helm and rusty chainmail, and it held a heavy two-handed axe in its bony fingers. A decorative silver horn was suspended on a leather belt around its neck. …the skeletal horror lunged at him with amazing speed, and struck. Blood flew and Gadur Yir fell unconscious on the ground. Horrified, Drolhaf Haffnarskørung rushed to his aid, barely able to damage the undead warrior while dodging its mighty blows. Franz turned himself invisible and quietly dragged Gadur Yir to safety. After a desperate battle, the barbarian and Greg somehow defeated the skeleton while Franz bound the half-orc’s wounds until he could stand. “The horn is worth some 160 gold, but we don’t know if it is magical” Greg the Rat-Catcher called. The others followed him down the cold passage, icy winds buffeting them. Shortly, they saw their lights reflected from a glittering surface filling much of a large cavern whose ceiling disappeared into the darkness. The ice lake stretching before them was like a single clear gemstone, and beneath the surface, they saw the entangled bones of several skeletons, frozen picks and shovels, broken beams and bent pieces of rail. Faint whispering seemed to sound from the corners of the icy mass grave. Drolhaf surveyed the scene for a long moment, then silently turned back, and the others followed. They spent three days and three nights in the mining camp to let their wounds heal. Drolhaf caught fish in the lake and Greg – who loved this lazy life – cooked, while they collectively got one of the houses in good enough shape to move from the cramped shed. On the second day, Drolhaf tried the horn, whose booming sound seemed to bounce from cliff to cliff, but produced no effect. “Now everyone knows we are here” Gadur Yir grumbled. “But at least we know it isn’t magical” countered the barbarian. He stepped by the column, and as he did, he seemed to step back through the gap to the right without reaching the other half of the chamber. He grinned, and continued from column to column until he was at the other side. A short, twisting passage decorated with fading frescoes led to an irregularly shaped room with several nooks, and three bearded statues on stone pedestals. A set of stairs descended to the lower level. “I am the empty hope!” Franz read the letters below the first statue. “I AM THE FALSE PROMISE!” the other one was just as mysterious. “I AM THE BROKEN WORD!” read the letters below the third. “Let’s just avoid them” recommended Gadur Yir, and they went for the stairs instead. The hall below stretched into the darkness. Frescoes of dark shadowy warriors, wearing horned helmets and holding torches loomed above the characters. “The same as the skeleton!” Greg exclaimed. The hall continued to a set of bars with an iron door in the middle that filled Gadur Yir with a horrible sense of déjà vu. He thought back to Perladon manor, but shook his head. Peering through the bars, he saw a decorative well, a doorway covered with heavy purple drapes, and even more frescoes in what looked like a sanctum. Instead of going for the centre of this evil place, they investigated the southern room complex. To the west, four skull-tipped spears were linked by pieces of rope in the shape of a rectangle, and in an alcove, there was a throne of carved wood with a small, gold-tipped baton resting on a cushion. Beyond the purple drapes to the south, the passageway made a slight turn before descending downwards. Gadur Yir beckoned, and the others followed quietly. The stairs ended in a long hallway with more frescoes of the dark warriors. To the side, small rectangular chambers opened one after the other, each with three sarcophagi bearing heavy lids carved with the images of fierce armoured knights. On each lid rested a golden chalice. “This whole area reeks of menace, as if it was demon-haunted. We shouldn’t touch anything. ... That means you! Hey!” Drolhaf Haffnarskørung snapped as he looked at Greg’s greedy eyes. Greg withdrew, licked his lips and turned away with a sigh. In the middle of the hall, they found a circular inscription with red letters: “THE HALL OF THE WEAK. LET THEIR FATE BE AN ETERNAL WARNING.” Beyond lie an empty chamber with unfinished resting palces, the sarcophagi still missing. “They were weak to resist temptation, Greg.” Drolhaf sounded at the end of his wits. The hall ended with a door to the left, then another set of stairs winding downwards. “Ha! This way!” Gadur Yir strode forward, but jumped aside with a curse almost immediately as a heavy pendulum swung at him. “...This way, but more carefully.” A few steps down, Greg found a collection of small holes to the sides, identifying an arrow trap. They bypassed the step, Gadur Yir probing the rest of the way with his swordtip. Yet he was almost in for a third surprise as a third step sunk down and a heavy stone block swung down on a pair of chains, almost knocking the helmet off of his head. “This must have been the beginning of the pilgrimage” explained Franz Who Wasn’t Even There. At Drolhaf Haffnarskørung’s suggestion, they searched the small cavern to the south, but it only contained a discarded pile of mouldering old robes. Turning their attention to the northern passage, they carefully proceeded down the gentle slope. The winds were getting warmer and warmer, and instead of the wet decay of the caves came fresher smells, then sunlight. At last they emerged in the mountainside above a small valley, surrounded on all sides by tall, snow-peaked mountains. Down below, the bottom was occupied by a forest and a small lake. Flowers bloomed in the meadows and there was birdsong in the air. “There is no such idyllic place in the world” came Greg’s ominous warning. (Session date 4 March 2017). Referee’s notes: Dungeoneering with a group of misfit characters absolutely unsuited for dungeoneering always has its charm, but it has been a blast with this new character roster. When I finished writing the scenario, I could only shake my head and guess how many of them would get out alive. 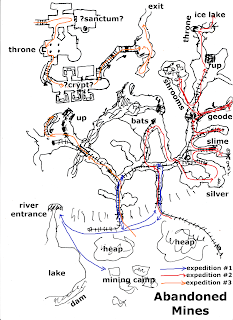 And yet, with one and a half combat-worthy characters (Drolhaf Haffnarskørung can stand his own, but is still less combat-oriented than Gadur Yir), and two who are best at not being seen in battle (Franz has a staggering six hit points at third level), they got through the mines in one piece. Sure, there were some lucky rolls (although ironically, it was the half-orc who was closest to death, twice), but much of the company’s success came from being careful but decisive, and choosing their battles wisely. I am still curious how far this specific character combination will get, since the lack of a cleric is already being felt, but so far, so good. And as for Gadur Yir, he has now deservedly learned the Wilderness Lore skill – if it was from trial and a lot of error, so be it. As I read further, I'll be curious to see if the PCs later return to pick up some of the "obvious" loot that they left behind---and what consequences befall them (if any!). Thanks, Allan! I'm also interested to see that. There is a lot more to the dungeon and the lands beyond it, and they may come into play later in the campaign. 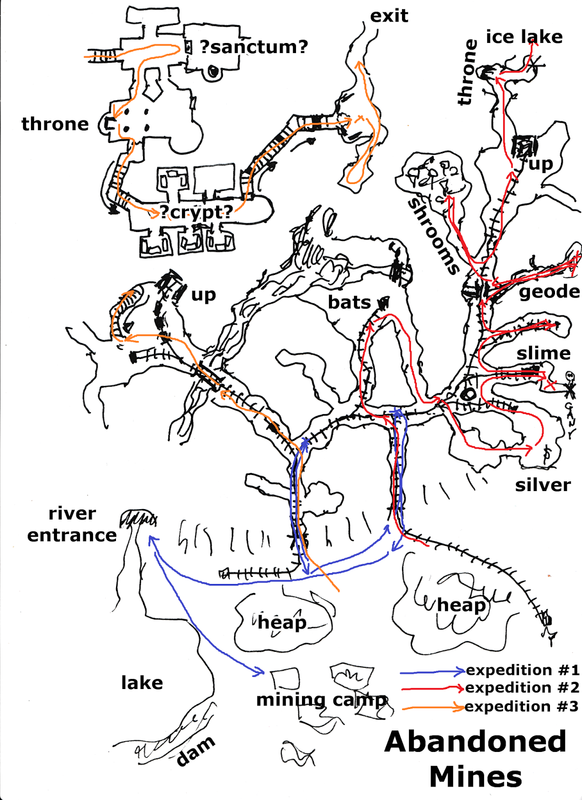 As things went, the players were wise to keep their expedition focused on finding a way through, because they suspected (not entirely incorrectly) that they were outclassed. However, I also believe it is better when a dungeon isn't completely covered and mapped out - when there is a sense of mystery remaining. 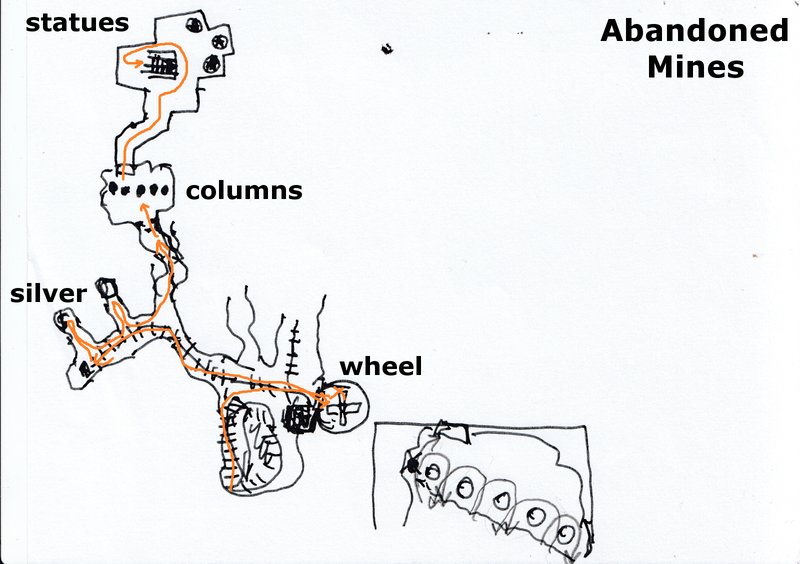 This is not a megadungeon-focused campaign, so the dungeons I have developed for it are on the smaller side (50, 43, 40, 62 and 55 keyed areas, respectively; there is one that may become larger), but they pack a punch to keep the players on their toes. This Sunday's expedition turned brutal when the company went down into a local murder-hole without a plan and sufficient caution. More on that soon!